During the month of December large money managers have been once again beefing up their long bets on crude oil. Bloomberg: - Hedge funds increased bullish bets on crude oil to the highest level in three months as stockpiles dropped and the U.S. economy expanded more than forecast. Money managers raised net-long positions, or wagers on rising prices for West Texas Intermediate crude, by 4.4 percent in the week ended Dec. 24, U.S. Commodity Futures Trading Commission data show. It was the fourth consecutive increase, the longest streak since July. What's driving this push into crude? The media focus has been on the recent sharp decline in supplies, which some have attributed to improving economic conditions in the US. While the US economy is certainly showing signs of improvement, there is more to this story than the domestic demand for energy. This drawdown in crude was the result of US refineries firing on all cylinders, particularly in the Gulf Coast states. In fact refinery inputs have hit a new record. As discussed earlier (see post), US energy firms can export gasoline and jet fuel abroad but are restricted from easily exporting US crude. With domestic crude production at recent record levels (see Twitter chart), refining and selling abroad is the name of the game. And that is benefiting the US refinery sector. Just take a look at the outperformance of Valero Energy Corporation (VLO). The mass media is looking for simple answers for these rising long bets and stronger prices on crude oil. The Columbus Dispatch: - Oil finished the year with a gain of 7 percent with much of the gain coming this month on signs that an improving U.S. economy is leading to greater demand for gasoline and diesel fuel. But the "US growth" explanation is not accurate. Over the past several years, US exports of refined products have tripled, going from about a million barrels per day to over 3 million. 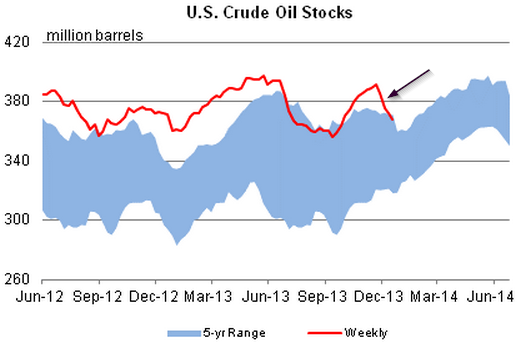 And bets on WTI crude are more about increased refinery capacity in the US and the resulting growth in exports.